Discover a new definition of Southern hospitality at the Jackson Marriott. We feature an outstanding hotel location in the heart of Jackson, Mississippi, allowing for convenient access to the area's top attractions; we're close to the Governor's Mansion, Mississippi Braves Stadium, and the Jackson Zoo. 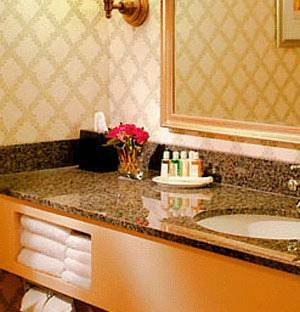 Our well-appointed hotel rooms and suites boast a wide variety of top-quality amenities, such as a flat-screen TV, high-speed Wi-Fi, a coffee maker, and a well-lit work area. In addition, you can take advantage of an impressive selection of hotel resources; indulge in exceptional dining at our signature restaurant, stay in shape at our fitness center, or take a refreshing swim in our hotel's heated outdoor pool. If you're seeking a sophisticated destination for an event in the Jackson, Mississippi area, look no further than our hotel; benefit from 20 flexible, contemporary venues and an experienced planning team. No matter the reason for your visit to our hotel, the Jackson Marriott will make you feel at home. Bistro Restaurant: Savor contemporary American cuisine and regional specialties at Bistro Restaurant. Start your day here in downtown Jackson with breakfast, or stop in later for lunch or dinner. Our chef will delight you, as will our recently renovated restaurant space. Bistro Lounge: After a busy day in Jackson, there's no better spot for gathering with friends or colleagues than at Bistro Lounge. Enjoy a casual atmosphere and tasty American fare.